The less in-your-face, more versatile Veloster piques our interest the second time around. 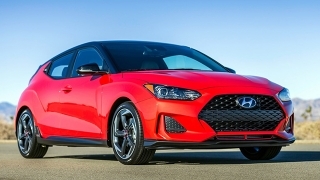 In the sea of mainstream cars, the 2019 Hyundai Veloster tries to differ with its quirky four-door styling, emphatic fascia, and somewhat sporty demeanor. I’ve had a quite memorable time with its predecessor two years ago, and that made me really excited to review the all-new version for this year. 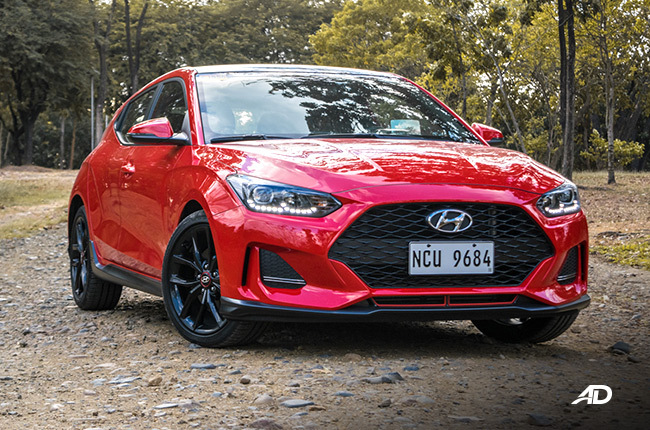 With a new platform, a more aggressive design, and an improved transmission, can the second-generation Veloster Turbo tick the right boxes for a desirable vehicle? 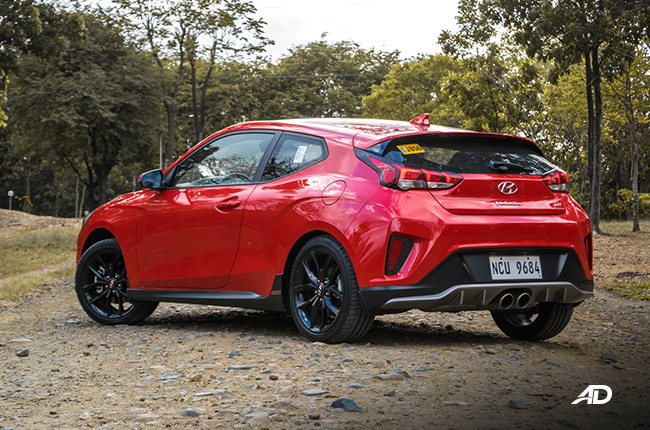 Hyundai Philippines handed over the keys of the sporty hatchback for several days, and here’s my verdict. Overall exterior and interior design piques interests. DCT has been refined but still has room for improvement. It’s hard to deny that the Veloster’s stint as a quirky compact hatchback works to its advantage. 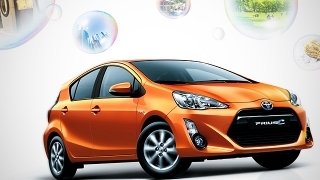 It now looks sharper when compared to its predecessor, keeping its poise as a fast-looking car. There may be a bit of an identity crisis going on, though. 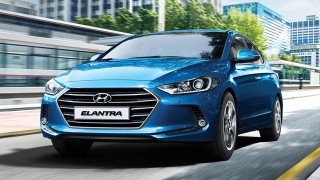 Is it a hatchback or a coupe? Well, I guess that’s part of the car’s appeal. 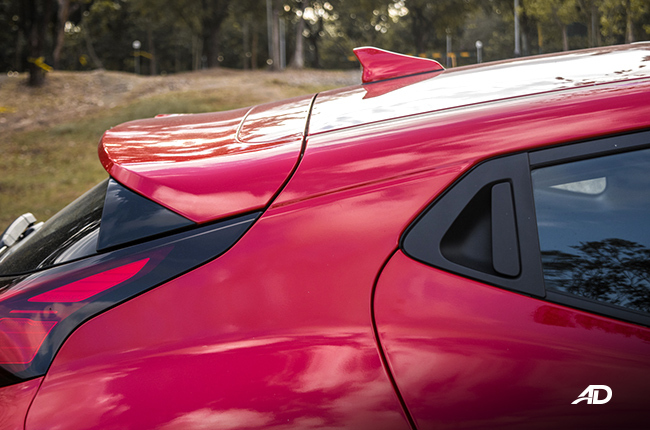 Like it or hate it, the Veloster does turn several heads wherever it goes. I personally like its set of LED lighting. They look good, day and night, and really work well in keeping the road lit, if I may add. Let me share a story. It was gloomy when I decided to shoot the Veloster. By chance, not by choice. Turns out, the contrast of the car’s red hue radiates an odious vibe. Devilish, even. Its intensity and agility reflect that infernal flair – at least when in Sport mode. Well, only when in Sport mode. More on that later. 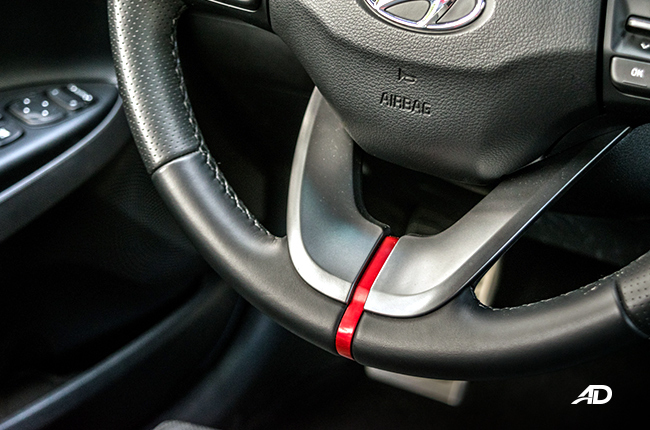 To match the devilish red paint, the Veloster’s cabin is adorned with red accents that radiates a sporty vibe. 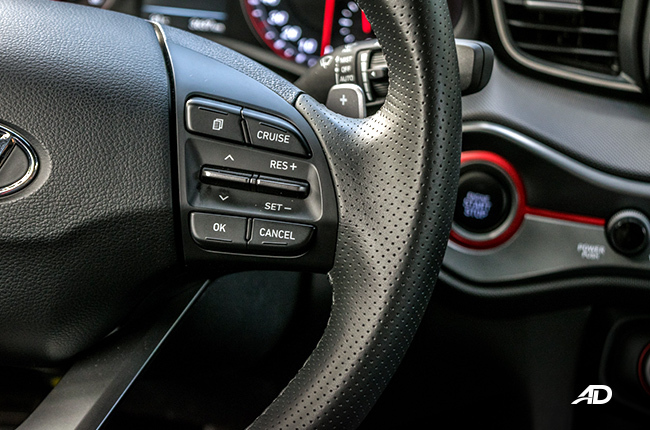 The dashboard layout is driver-centric, too, but I want to point out five things that I adore in its interior. First, the air-conditioning vents are huge and the system could cool the cabin quickly. 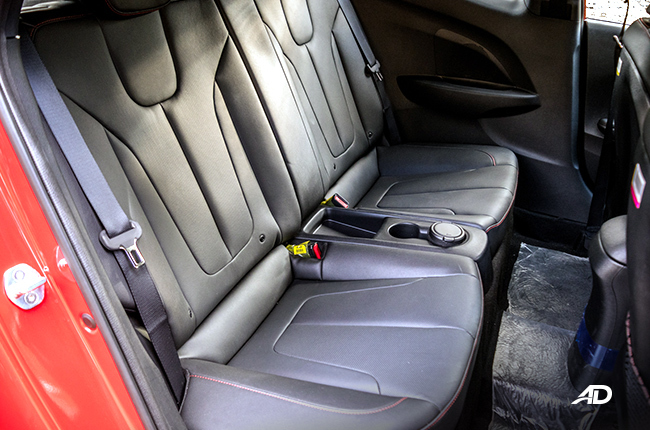 The leather-clad bucket seats are also quite comfortable and well-bolstered. Even better, the controls are clustered nicely for easy familiarization, while the all-leather affair makes the entire interior feel premium. 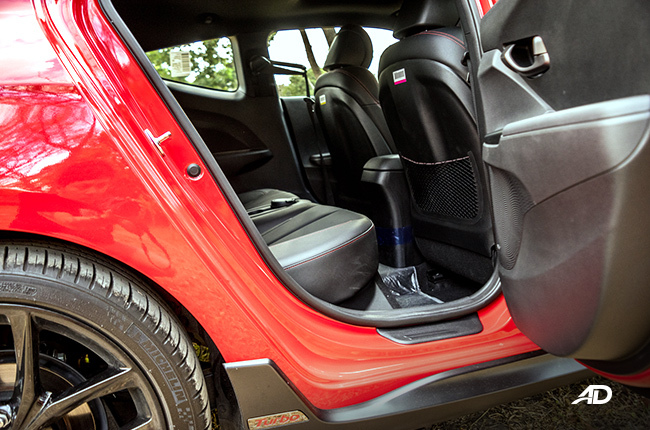 Lastly, even as a sporty vehicle, the Veloster has a lot of cubbyholes, cupholders, and bottle-holders to put your stuff in. However, just like any car, there are still a few gripes primarily because of the Veloster’s peculiar styling. The two-seat rear is a bit claustrophobic for those standing 5’8” and above because of the low headroom and small triangular window. 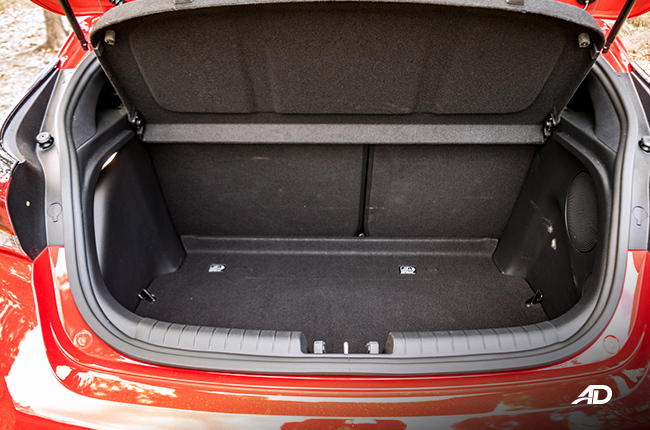 The trunk is also shallow and could barely fit a two-fold child stroller. Good thing the trunk lid is removable and the rear backrests can be folded in 60:40 fashion. As for comfort, it's generally okay as expected; the suspension setup is a little stiff and doesn’t change with drive modes, translating to minimal body roll but kind of painful on imperfect roads. 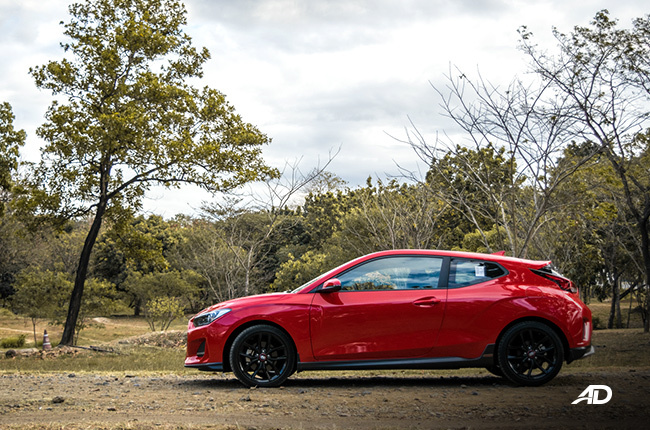 As a sub-P2-million car, the 2019 Veloster is expected to have top-notch high-tech features – and it does so with flying colors. The driver’s seat is power-slidable; the backrest adjustment is manual so entry to the rear via the driver’s side would be easier. 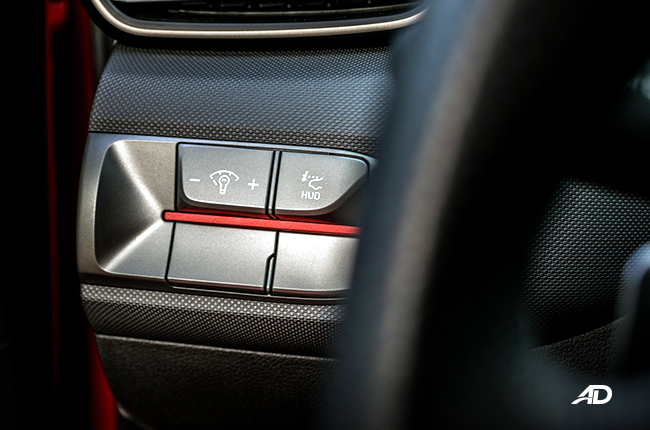 There’s also speed-sensing door locks and auto up/down for the driver. 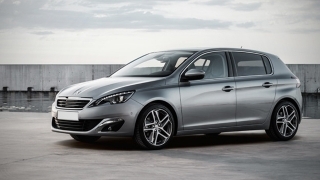 Other convenience features include automatic lighting, rain-sensing wipers, cruise control, rear parking cameras with sensors, and the steering wheel with telescopic adjustment. 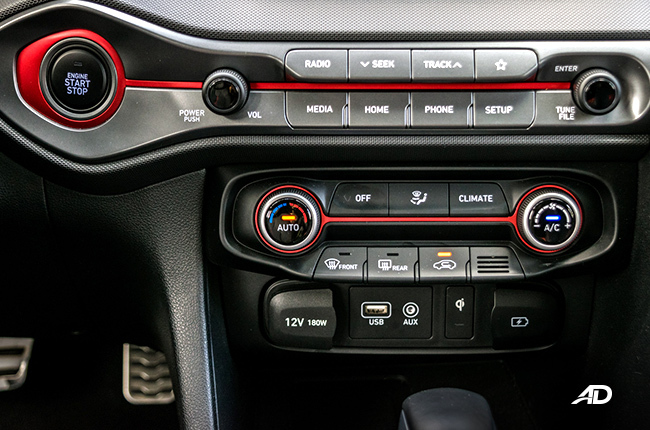 Another great thing about the Veloster is its 8-inch floating infotainment system. 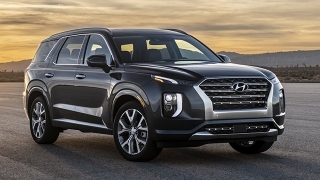 Just like the Tucson’s, it has a superb, crisp display and doesn’t have colors that would alienate the whole cabin appeal. It still has knobs and buttons, too, which is a positive thing in my books. 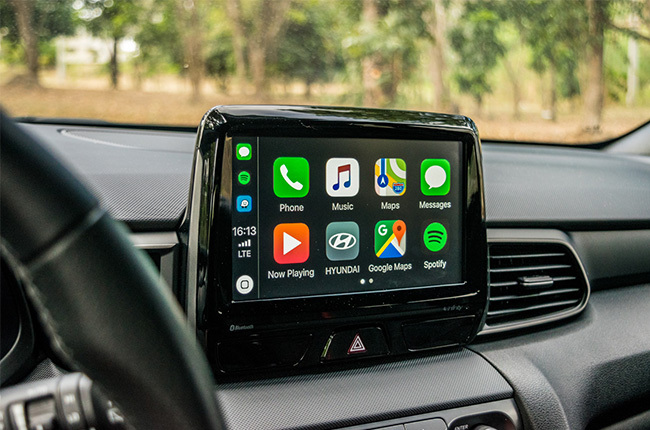 And of course, Apple CarPlay and Android Auto, which means seamless smartphone pairing and voice control. 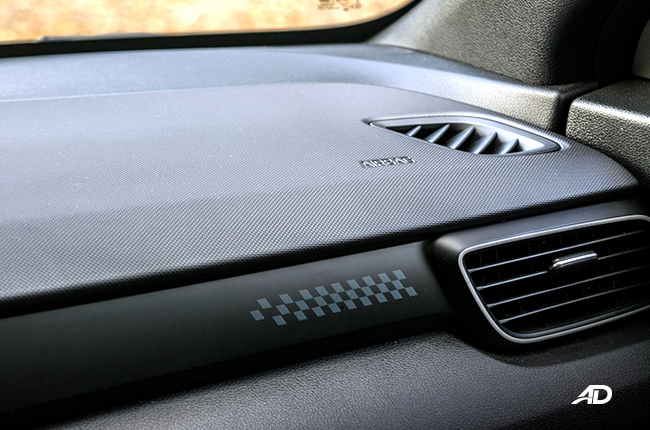 The speaker setup is also above average and can satisfy an audiophile’s need for good music while driving. 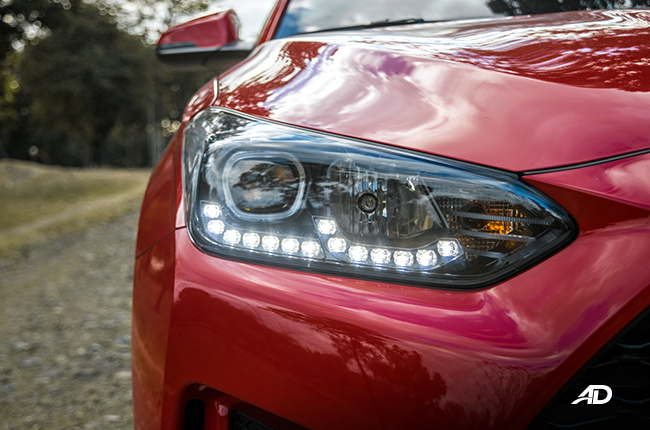 It wasn't just raving when it comes to the Veloster Turbo's tech offering – the glass of the heads up display tend to be obstructive. You'll have to choose between sitting high or not using it at all. I ended up shutting it down throughout the whole lend out. 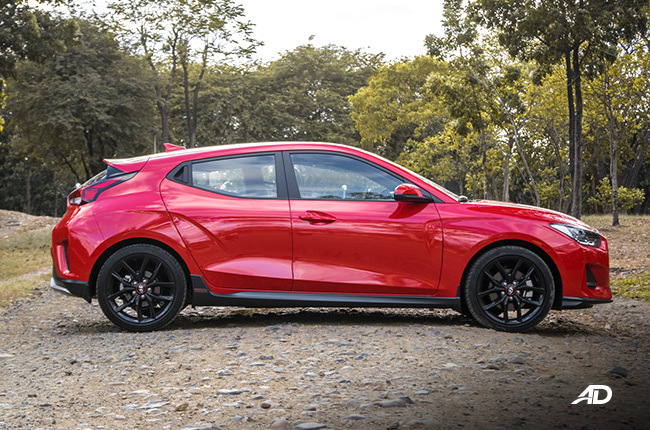 For its latest version, the Veloster has a pretty standard number of safety and security features to go with its price. 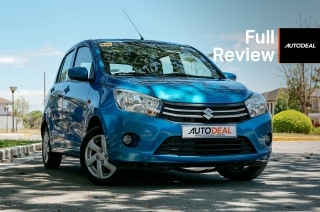 It has dual front, side and curtain airbags, as well as ABS, keyless entry, ISOFIX child seat tethers, and an immobilizer. The driver and front passenger have seatbelt reminders as well. 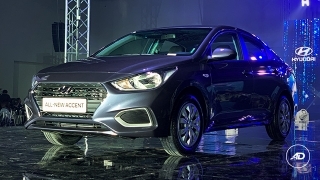 I said standard as Hyundai could have given the car blind spot monitors because frankly, the small rear windows and tapered side mirrors employ a huge blind spot at the rear right side. 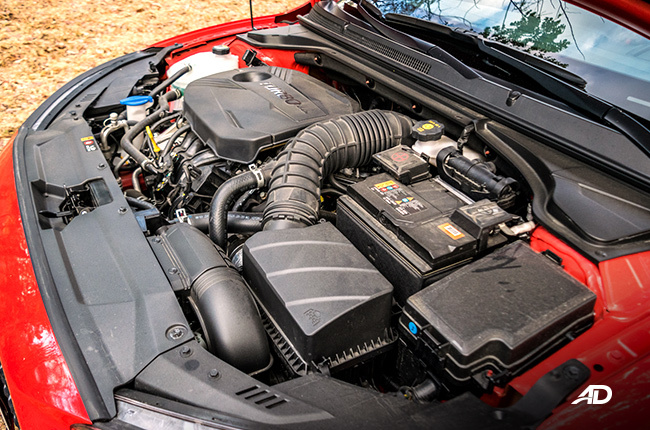 On paper, the 2019 Veloster’s carryover 1.6-liter turbocharged gasoline direct injection engine from its predecessor produces 201 horsepower and 265 Nm of torque. 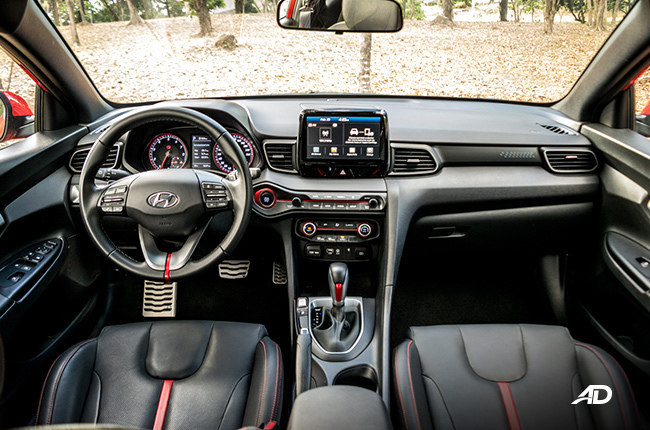 I would need to segregate its performance and handling nature into four parts to match the Veloster’s driving modes. Normal: Perfect for daily drives within the city. 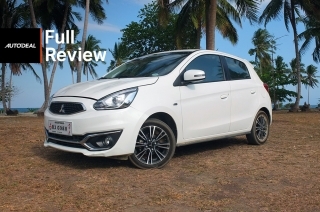 Don’t expect a sporty drive in this mode as it feels like a regular proper sedan/hatchback. 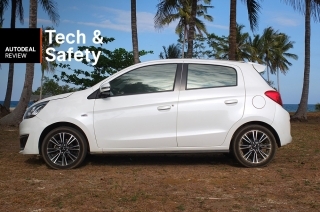 Handling is okay, but not too tight, while the seven-speed dual clutch transmission has been greatly refined but still needs improvement at times. Eco: Don’t bother. Why buy a Veloster if you’ll go Eco, right? Besides, Normal mode is thrifty on its own anyway. 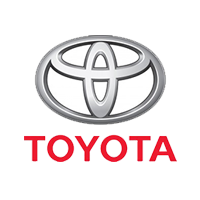 See fuel economy figures in the next section. Smart: Honestly, I didn’t feel any difference between this and Normal mode, and that’s kind of absurd. 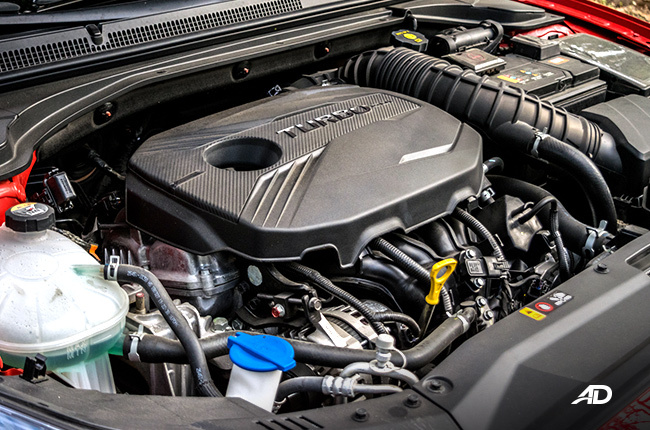 Sport: The force-inducted engine was spirited, engaging, and ready to take any inputs from the driver. The vehicle turned into an obedient machine, accepted commands without question or hesitation, and reached high-revs quicker for peak torque. Steering felt tighter which accounted for somewhat precise steering, although there were still moments of understeer as expected from its front-wheel drivetrain. In as much as I wanted to stay in this mode, fuel consumption suffered, so there’s that. Of course, there were things that needed improvement. 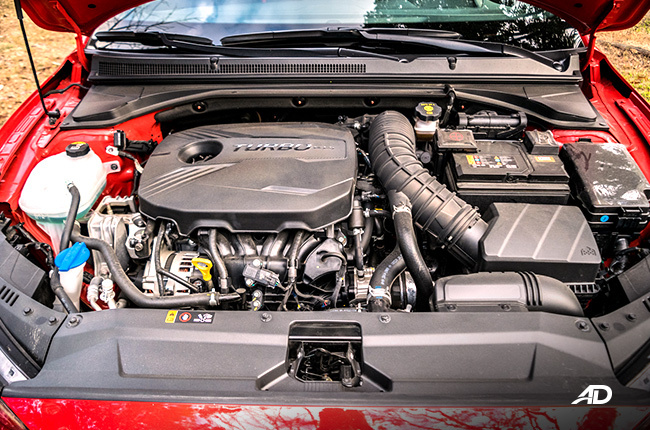 Apart from the transmission, its power delivery wasn’t as punchy as before. NVH insulation has been improved but road and wind noise would start creeping in at around 60 km/h. Lastly, the brakes bit hard but my feet needed to travel farther than expected in order to get that bite. I kept the car in Normal mode while testing its fuel efficiency. Crawling through Metro Manila traffic for an hour read 7.1 km/L, while faster paces at around 60 km/h registered a very decent 11.1 km/L. Relaxed highway drives with the cruise control nailed at 90 km/h clocked in 16.8 km/L. Quite thrifty for a sporty vehicle, I must say. 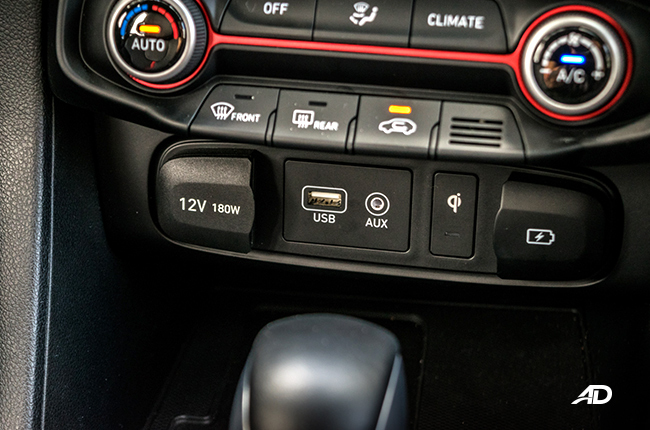 Admittedly, I was initially disappointed in the Veloster Turbo during the first days of having it for this full review. I can still remember the in-your-face power delivery of its predecessor from two years back. 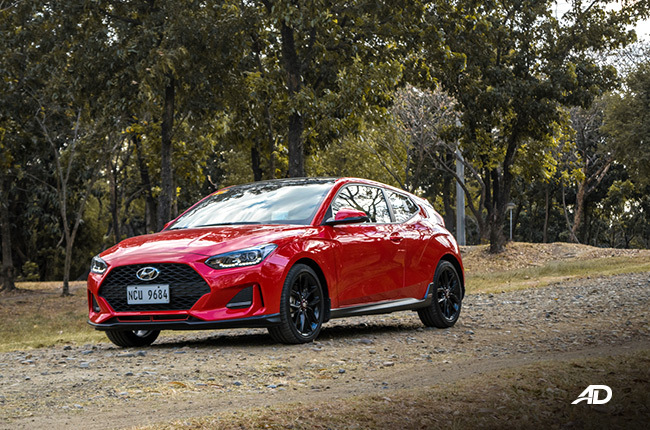 In contrast, the 2019 Veloster coddles its driver and passengers better than before, and that left me wanting for more action and visceral experience. 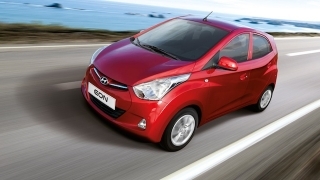 But after returning the media unit, I understood what Hyundai is trying to sell with this car. It’s a flexible machine that can still somehow satisfy your thirst for speed when you want it. 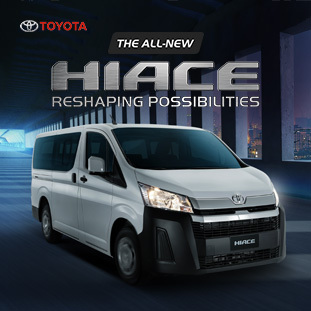 It’s more refined, more comfortable, and more mainstream than its predecessor. 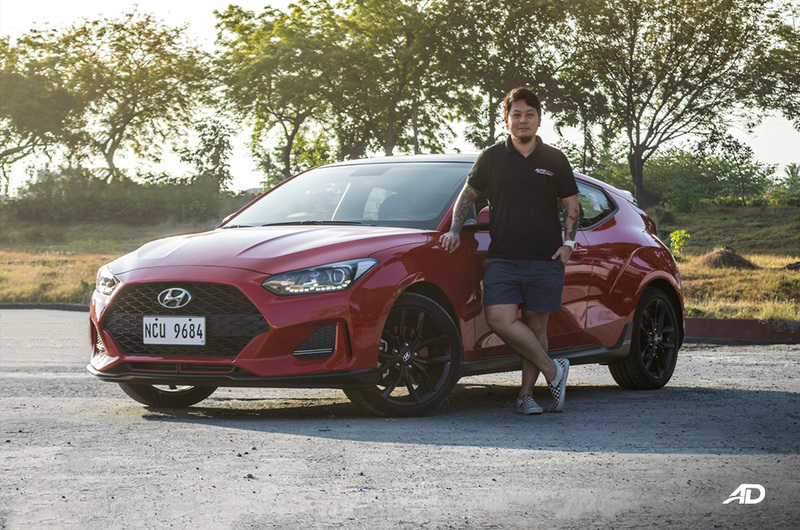 For all its intents and purposes, and considering its P1,798,000 price tag, the 2019 Veloster is still a niche offering that leans towards catering those who want the best of both worlds. A good thing? Depends on you, really, but it gets a thumb up from me. 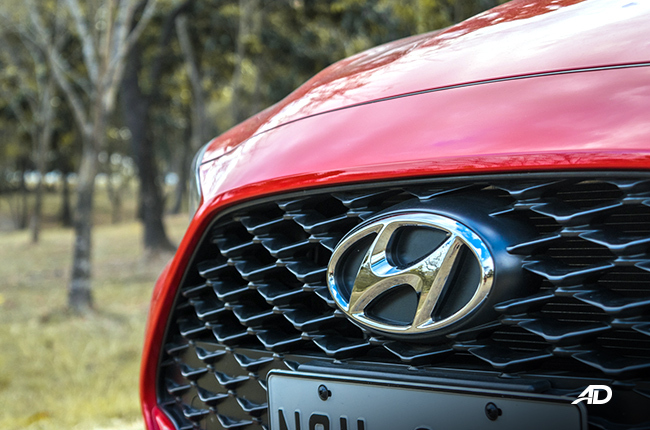 Besides, if you want a more in-your-face drive, the more potent 2.0-liter Veloster N is available in Hyundai dealerships through indent order. Ah, that changes the game. Hi, I would like to receive a financing quote for the Hyundai Veloster Turbo 1.6 TGDi, thank you.